HOME is where our stories begin. Wishing you the most grateful Sun Valley Thanksgiving ever. In my book, good fun, good food, and good friends define our Thanksgiving. Making some dishes head of “the day” leaves time for skiing on Baldy, or if the weather doesn’t cooperate, a bike ride. 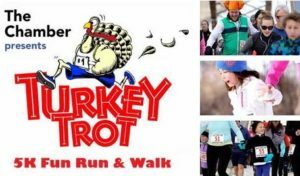 And don’t forget the Turkey Trot in Hailey! If you aren’t in Sun Valley for Thanksgiving, I hope you make it here for Christmas. Here’s my favorite and yummiest make-ahead mashed potato recipe. And yes, it’s a good idea to do something active to offset the dairy in this recipe. Make your holiday easy and prepare these mashed potatoes ahead. Assemble the dish, including the Parmesan, and refrigerate for up to 3 days. Bake before serving. You can peel the Yukon gold potatoes. Or not. I don’t. Place the potatoes, garlic and 1 tablespoon salt in a large pot with enough water to cover the potatoes. Bring to a boil over high heat, reduce to a simmer and cook for 20 to 25 minutes, until very tender. Test at 15 minutes so you don’t over cook. Drain the potatoes and garlic and mash them with a hand-held electric mixer. While the potatoes are still hot, stir in the goat cheese, butter, sour cream, half-and-half, 4 teaspoons salt and 2 teaspoons pepper until smooth. Pour the mixture into a 9 x 12 x 2-inch oval baking dish, smoothing the top. Sprinkle the Parmesan on top and bake for 30 to 40 minutes, until lightly browned. Sprinkle with chopped green onions. Serve hot. One of the best Thanksgiving traditions in the Valley is the annual Turkey Trot. The 5K Fun Run and Walk will be celebrating its 15th year on November 22nd. The late-morning event is extremely popular with locals and visitors alike. Nearly 800 folks are expected to enjoy trotting on Thanksgiving day along the Big Wood River and through the Draper Wood River Preserve. We STRONGLY encourage all participants to pre-register online through 6 PM on 11/21/18. If you prefer to register in person The Chamber is located at 781 South Main St, Hailey. You can register through Wednesday, November 21st between 9 a.m. and 4 p.m.
Day Of Registration begins at 8:30am. The Run starts at 10:00am at Sturtevants. For more information on a Sun Valley Thanksgiving, visit Sun Valley.com.